NYC, 02/27/2019, 6:00PM. 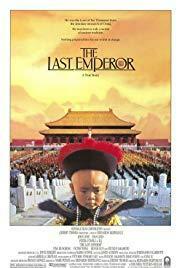 Bernardo Bertolucci's The Last Emperor (1987): 9-Time Oscar Winner. The story of the final Emperor of China. Stars: John Lone, Joan Chen, Peter O'Toole. 163 min. In 1987, Bertolucci, one of the greatest Italian film directors of his generation, directed the epic The Last Emperor, a biographical film telling the life story of Aisin-Gioro Puyi, the last Emperor of China. The film uses Puyi's life as a mirror that reflects China's passage from feudalism through revolution to its current state. The Last Emperor was the first feature film ever authorized by the government of the People's Republic of China to film in the Forbidden City.